Project Summary: Trout Unlimited, a third party “Good Samaritan,” will restore abandoned mines on private property to improve trout habitat in American Fork Canyon. Oxidation ponds (lower left) installed at Pacific Mine help reduce levels of heavy metals in mine drainage before it enters the river. Experts believe that there are more than 500,000 abandoned hard rock mines in the West that are adversely affecting 40 percent of the region’s stream headwaters as they leach heavy metals into ground and surface waters. Federal land management agencies are reclaiming the most problematic mine sites on their lands, but they do not have programs or funding for the thousands of abandoned mines located on privately owned lands. The American Fork watershed, southeast of Salt Lake in the Wasatch Mountains, is still being adversely affected by long-abandoned gold and silver mines. Of particular concern is a fragile population of native Bonneville cutthroat trout, which has persisted despite the River’s mine-related issues. Trout Unlimited recently began a mine reclamation initiative on private lands in American Fork Canyon with a demonstration project on landscapes owned or managed by Snowbird Ski Resort. 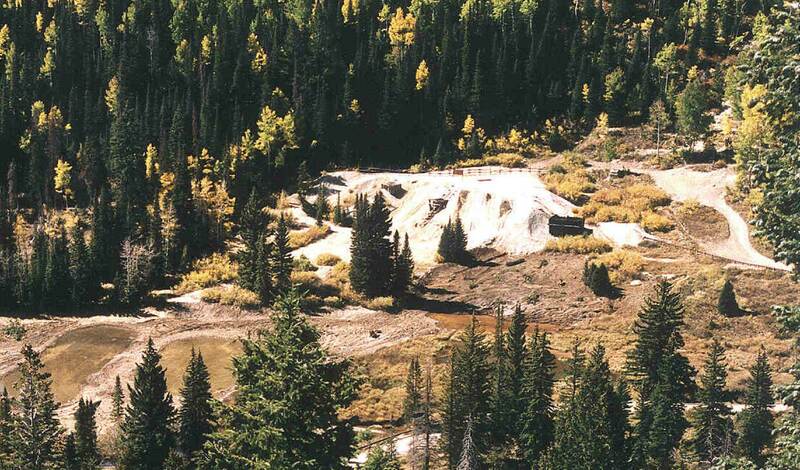 The Resort acquired the mineral-patented lands and abandoned mines in the 1960s, before concerns over mine contamination impacts to human health and natural resources grew to their current levels. Concerns over potential liability have long discouraged voluntary cleanups. The U.S. Environmental Protection Agency (EPA) Region 8 and Trout Unlimited are working on an administrative order to clarify the responsibilities and minimize potential liabilities as the cleanup moves ahead. Trout Unlimited, Utah County, Utah Department of Environmental Quality, Snowbird Ski Resort, the True North Foundation, Tiffany & Company Inc., EPA, USDA Natural Resources Conservation Service (NRCS), and others. The administrative order between the EPA and Trout Unlimited is the first time the agency has allowed a “Good Samaritan” to restore an abandoned mine, providing a national model for federal agencies to enable cooperative conservation efforts. Mine wastes with elevated levels of heavy metals will be removed from the abandoned Pacifi c mine, Blue Rock mine, Scotchman No. 2 mine, and the Pacifi c mill. They will be safely encapsulated in a permanent repository to be constructed at Pacific mine on Snowbird’s property. As a result, water quality will improve in ten miles of Canyon streams that traverse the Unita National Forest and Timpanogos Cave National Monument. This will help recover a rare resident population of Bonneville Cutthroat Trout. Using diverse partnerships and third party “Good Samaritan” organizations to successfully reclaim abandoned mines on privately owned lands.